A studio-style cabin with 1 bedroom, 1 bathroom, and room for 2 guests, Lover's Retreat is just what the name suggests – the perfect getaway for couples on honeymoons, anniversary trips, or romantic “just because” weekends. It's also great for someone seeking a peaceful retreat after days exploring the nearby Great Smoky Mountains National Park. 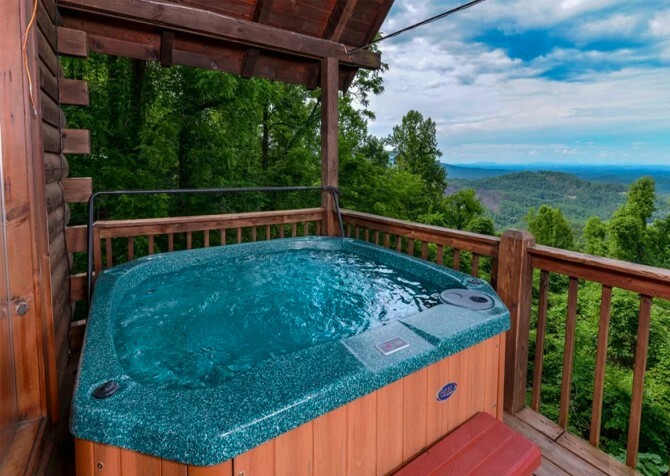 Along with the many amenities at the cabin – jetted tub, big screen TV, grill, and more – Lover's Retreats offers easy access to a trolley stop, the Gatlinburg Community Center, and Rocky Top Sports World. 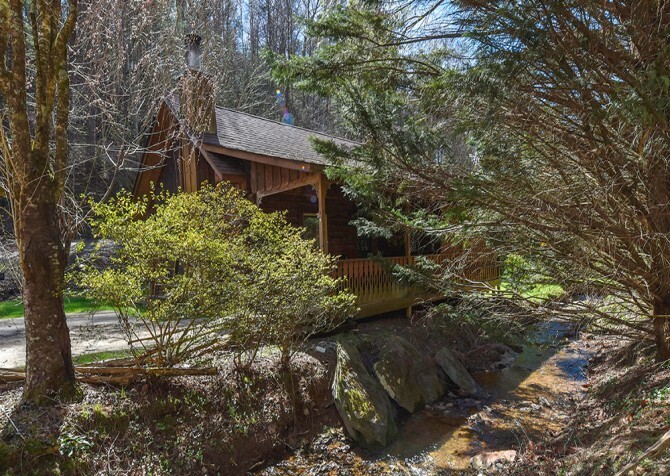 You'll find cozy spaces and the comforts of home in this charming Gatlinburg cabin. A cozy place to call home, the living room of Lover's Retreat is perfect for entertaining or relaxing. Windows around the room fill the space with lots of natural light, allowing you to feel like you're tucked away in the mountains. Through the windows, enjoy peaceful wooded views. 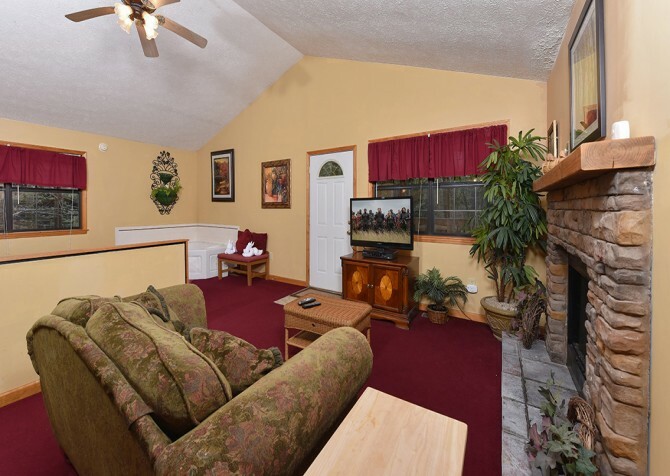 Curl up on the sofa or sit back with a good book in the chair as you stay warm by the gas fireplace on those cool Smoky Mountain evenings. In summer, you'll have a comfortable place to keep cool and watch your favorite shows on the big screen TV. For some ambient lighting, flip on the floor lamp by the sofa. 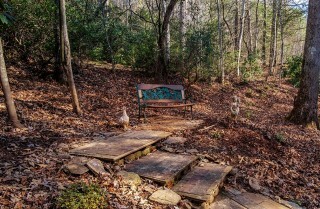 Whether you're here for relaxation or romance, you'll appreciate the peace and privacy of your own cabin in the woods. 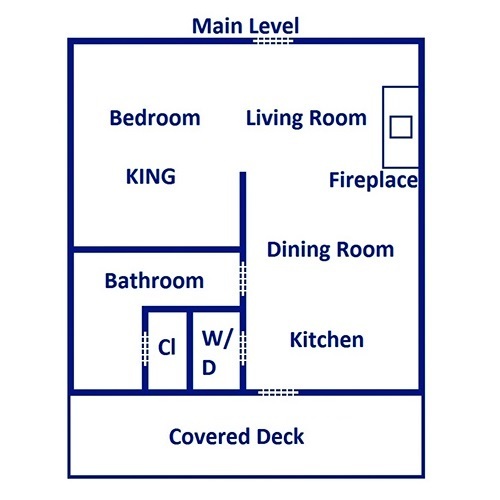 If you need some fresh air, you can step out onto the deck that's easily accessible through the living room. A great way to save money on vacation is by cooking some of your own meals in the cabin. 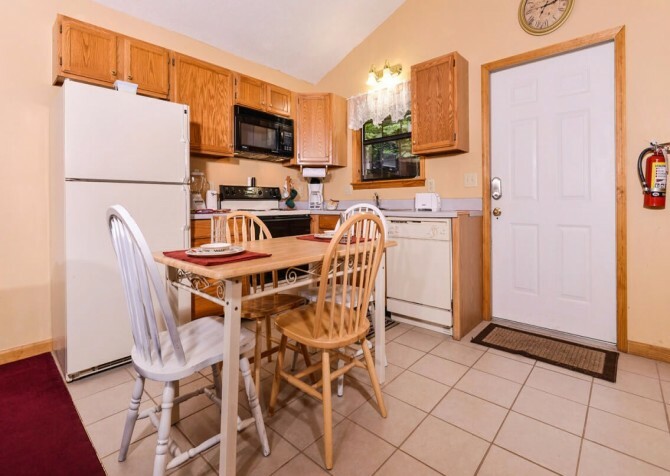 With full-size appliances and the dishes, glasses, utensils, and kitchen essentials you'll need, Lover's Retreat allows you to prepare homemade meals and snacks in the comfort of your own cabin. There's enough counter space to lay out snacks, and the refrigerator is great for keeping your favorite drinks on hand. Stock up on the way into town, and you won't have to make a trip when you just want a quick bite. If you do prefer to go out to eat, Gatlinburg has many restaurants to choose from, offering almost any type of food you can imagine. You can store leftovers in the refrigerator to snack on while you're watching movies in the cabin later. As you make meals, the open layout will allow you to chat and visit. You won't feel stuck in the kitchen here! Located in the kitchen, the dining area features a table for five, so you'll have room if you have guests coming for dinner. If it's just the two of you, have a romantic candlelit dinner. You can add one on when you book and have all the ingredients for a wonderful meal – candles, steaks, baked potatoes, salad, bread, and more – waiting for you in the cabin. Having meals in the cabin is a great way to spend more quality time together. You can even check out our blog for easy cabin recipes. 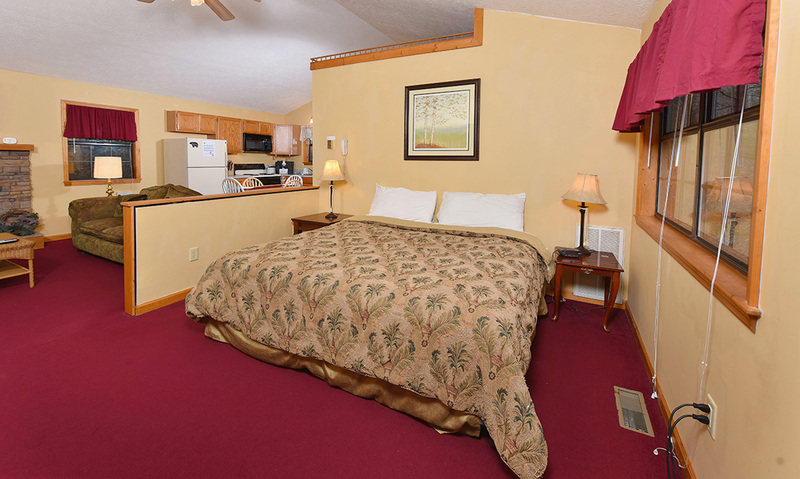 The bedroom of Lover's Retreat features elegant touches and great amenities. The king-size bed has a soft white canopy draped above it, making it feel like a true escape. There are nightstands with lamps on either side of the bed, so you can read at night without disturbing the other person. There is also a window by the bed, allowing you to wake up to the natural light in the mornings. In the corner, a jetted tub is ideal for a relaxing bath. Have a refreshing soak to start your day or hop in just before bed. 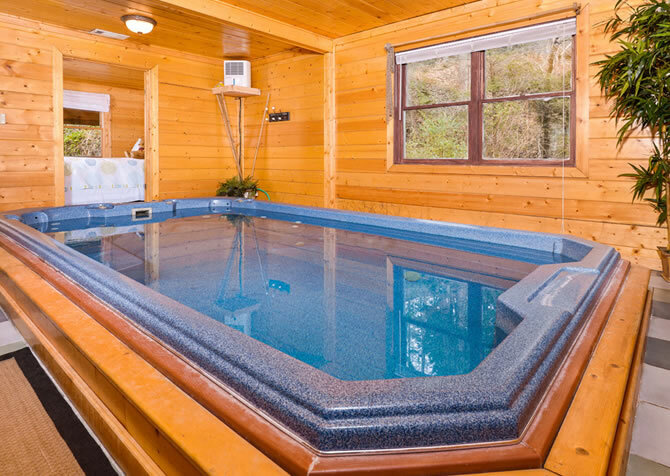 Either way, this soothing jetted tub will allow you to enjoy some peace during your time in the Great Smoky Mountains. 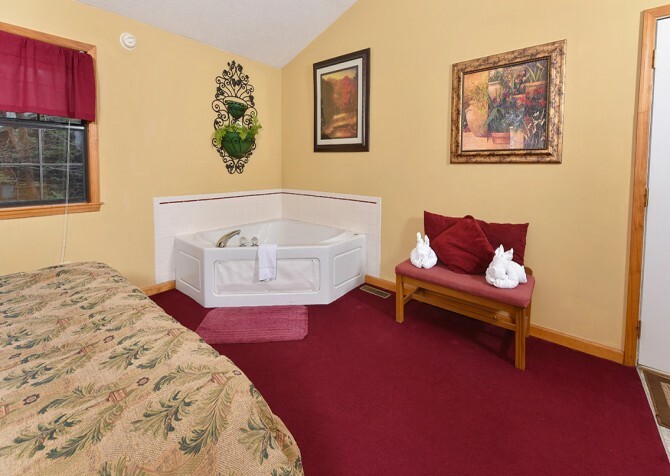 The bathroom of Lover's Retreat offers a convenient space for getting ready. 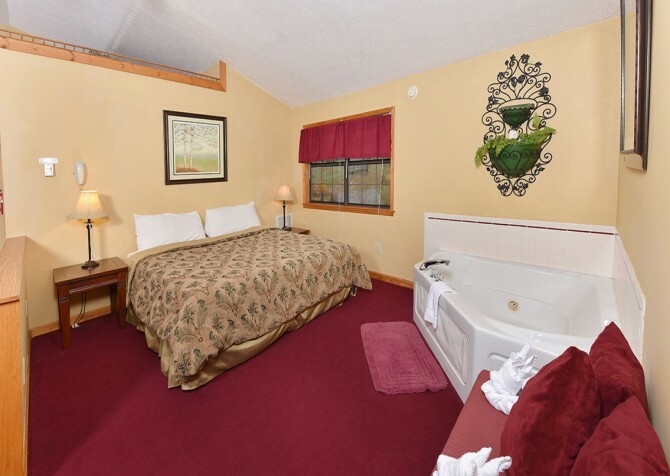 Hop in the shower before heading to downtown Gatlinburg for the day, or rinse off after an afternoon of biking or hiking in the national park. There is also ample counter space by the sink, so you can unpack toiletries for your convenience. When you vacation in the Great Smoky Mountains, you have to spend at least some time in the beautiful outdoors. Even if you're not planning to hike or go horseback riding, you can enjoy the Smokies from your cabin. 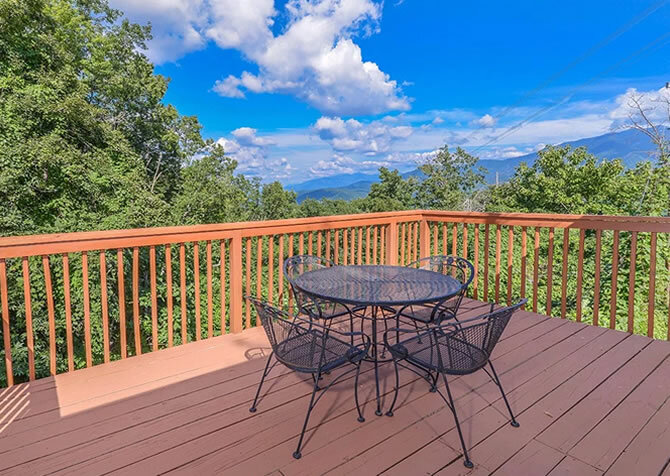 On the deck, sit back in the rocking chairs with a glass of wine or some coffee and let the fresh mountain air wash over you. There's a charcoal grill if you want to toss steaks, burgers, and hot dogs on during nice days. One of the biggest perks of staying at Lover's Retreat is having a fantastic location. 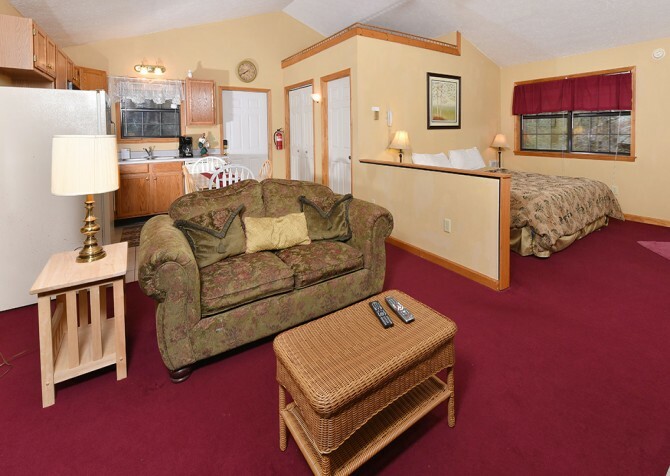 Just a few hundred yards from a trolley stop, Lover's Retreat makes it easy to get into town without even driving. Hop on the trolley and travel downtown inexpensively without having to fight traffic or find parking. Also nearby is the Gatlinburg Community Center, providing even more fun. It's home to a bowling alley, basketball courts, a pool, and much more. Between the community center, the cabin's amenities, and the dozens of shops, attractions, and restaurants downtown, you'll find plenty to fill your days during your Gatlinburg vacation. During your stay, you'll also have a washer and dryer in your cabin, so you can pack light! This indoor/outdoor sports complex in Gatlinburg plays host to dozens of sporting events throughout the year. Stop in to watch basketball, soccer, softball, kickball, volleyball, and much more. With tons of entertainment, from shows to rides, Dollywood is an entire day's worth of fun. Enjoy live music and many other performers at Dolly Parton's theme park. Spend a day walking, driving, or riding the trolley along the Parkway as you check out what the city has to offer. Watch shows, have dinner, fill up on pancakes, get an old-time photo taken, and get some great gifts to take back home.